I recently travelled 2517 miles to try to solve 50 problems in 50 days using design — a journey that would challenge me to fundamentally rethink my understanding of the user-experience design process. I set myself a challenge. I wanted to test the limits of design’s ability to solve problems — big and small. To do this, I left the comfort of my computer chair and set out into the unknown. Each day, I had 24 hours to observe a problem, attempt to solve it and then communicate the solution. On my own shoestring budget, from grimy backstreet hostels to bustling cities, I travelled Europe attempting to solve a different social problem that I observed every day. The project itself was an incredible experience. Some days, my solutions were OK, some days I failed, and some days the solutions were great. The point, however, was not to succeed, but to get up every day and try again — even when I had failed the day before. The adventure taught me an unbelievable amount about design’s power to solve problems and about my own capacities as a designer. Importantly, it honed my ability to think through and tackle problems rapidly. In the first of three articles, I’ll share what travelling from the bustling metropolis of London to the cobbled backstreets of Turin taught me about the design process and about the power of empathy to foster innovation. It was day 19 of my 50-day adventure. I found myself dashing to catch an underground train, running until I arrived at the station to find a sea of people crammed onto the platform. There were problems on the line, and trains were delayed. Surveying the scene, I decided to make this my problem for the day. Observe. I examined the flow of people, watched them jostle for position and looked at the methods of entry and exit from the platform. Analyze. I calculated the time between trains, counted the number of people waiting to board and tried to identify patterns in the way people behaved. Interview. I spoke to people waiting to board, asked them how they felt and what would make this experience better. … and came up with nothing. At best, I had some pretty predictable solutions, chief of which was simply to increase the number of trains — a solution that hardly felt adequate. I looked up to find a hefty underground attendant shouting at commuters. I walked over and asked him what the problem was. The next train rolled in. Immediately, the train pulled away, and I tried to find a place to stand, still surprised that I had decided to board. As I tried to find a spot among the sweaty mass of people, I suddenly understood the real problem. There was space further down towards the middle of each carriage, enough to fit at least another 10 people. However, people didn’t want to move down the carriages. 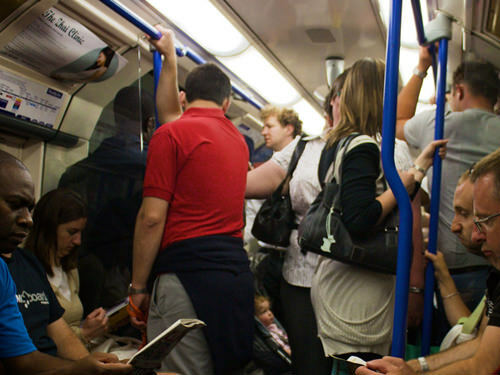 Instead, they crammed by the doors for fear of not being able to get off at their stop. Whereas my best design processes had failed, getting on the train revealed the real problem to me as clear as day. I discovered the underlying problem not because I had observed, analyzed or interviewed, but because I had felt it myself. Trying to solve 50 problems in 50 days enabled me to realize, among other things, that the constraints of our design process can allow us to neglect a vital tenant of creating truly effective solutions: it can allow us to miss real empathy. Real empathy is not naturally fostered in focus groups. It’s not uncovered in analytics. 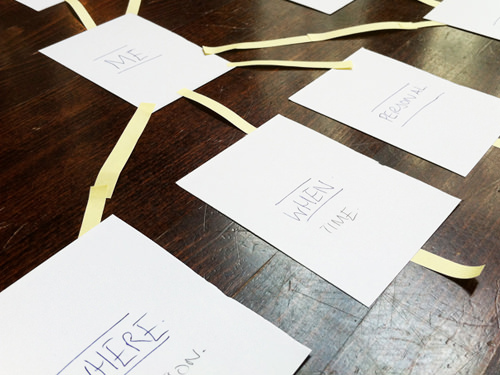 It doesn’t start with personas or empathy maps. Real empathy starts with people. My adventure fundamentally challenged me on how we understand people as part of our design process. The quality of our problem solving is directly linked to our ability to understand the problem. As I tried to tackle a new problem every day, I learned that analysis of people’s behaviours and problems simply wasn’t enough — I had to make them my own. 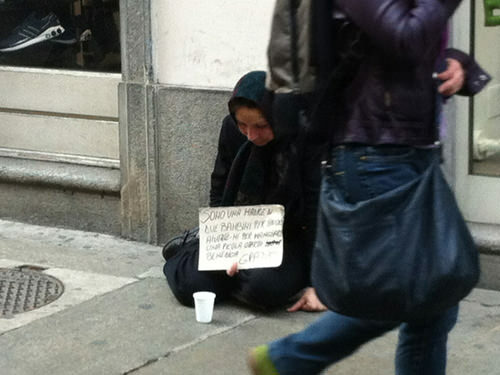 Sitting with the homeless on day 24 of 50 in Turin, Italy. From sitting with beggars on the streets of Turin (day 42) to getting lost in the streets of Antwerp (day 23) to having no money or energy in Zurich (day 38), my adventures immersed me in unfamiliar situations and enabled me to learn, analyze and solve more effectively than I ever could in isolation. Empathic research helps us understand our users’ needs beyond the functional, enabling us to develop more appropriate design outcomes. It is one of a raft of valuable processes and tools, on its own seemingly no more important than any other. However, while good designers understand the tools, great designers understand people. Empathic research is not new. Yet, it is too often treated merely as a tool to create new products or as the domain of pin-up design agencies that have the budgets and clients to accommodate this type of critical inquiry. This needn’t be, and simply is not, the case. The best-designed solutions, however small, are born from real understanding of the underlying, complex needs. 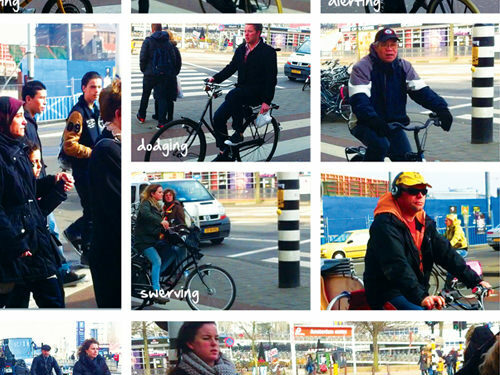 Observing the behavior of bicycle riders on day 28 of 50 in Amsterdam. We can’t all travel thousands of miles every time we start a new project, and commercial realities constrain the time and resources of our projects. 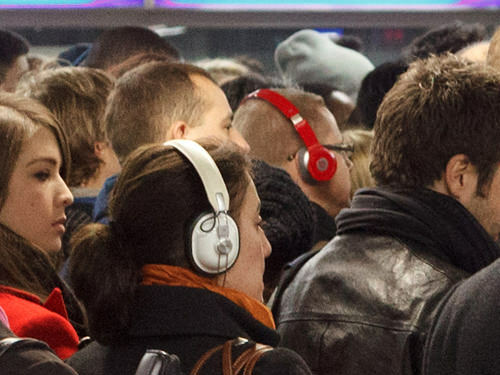 However, gaining a deeper understanding of people doesn’t require allocating drastically more time for ethnographic research or sacrificing other areas of the process. Below are some of the methods I started to employ on my adventure, with many more picked up along the way. Use them, build on them, and develop your own. Our aim should be to understand people more deeply and, in doing so, to solve their problems more effectively. Do everything you can to feel what your audience feels, whether it’s ecstasy, powerlessness or relief. 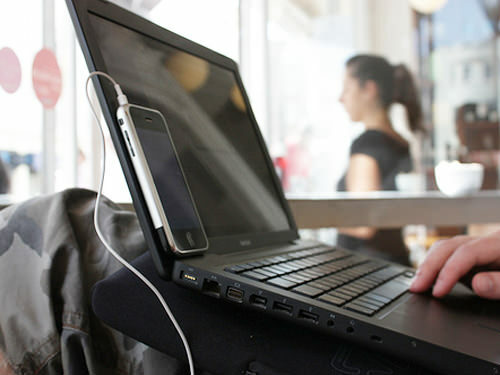 Say you are tasked with creating a journey-planning website. It is too often a temptation to unquestioningly rely on the conventions we’ve accumulated from other designed experiences. Innovation is born out of a natural distrust of convention and a desire to create smarter, more intuitive experiences. Pick two locations you’ve never been to and try to travel from one to the other without using any technology. 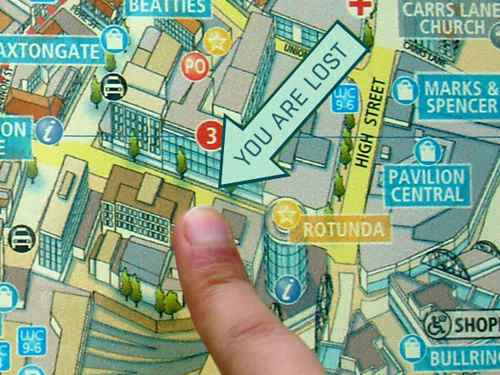 You’ll soon have that unnerving feeling of being lost in unfamiliar surroundings. Doing so will surface valuable, first-hand insight into the interventions you’ve relied on when no technology was at hand. How did you find your way? Which landmarks guided you? What processes did you rely on? How can these tools be translated into your service? The empathic research process is grounded in understanding an experience from the user’s perspective. Feeling what your users feel will enable you to understand complex scenarios more intimately and, in doing do, to solve them more effectively. 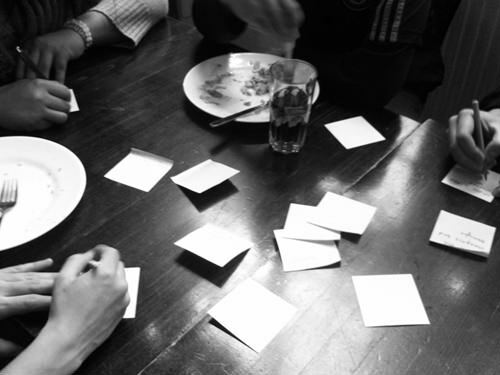 An impromptu co-creation workshop to solve communication challenges, on day 29 of 50 at my hostel in Amsterdam. To gain empathic understanding, rather than distanced analysis, go to meet people where they are — in their environments, not in our labs. Focus groups give us some insight into people’s experiences, but they can’t enable true understanding. We’re aware that experiences are felt: they are predominantly emotional not rational. By asking people to communicate their experiences in our settings, we are asking them to rationalise their thoughts and actions. This can never paint an totally accurate picture. Rather than interviewing users, we should look to meet people. Take creating an e-commerce website for a bathroom retailer. Go down to a showroom and watch how people interact with the products. Meeting people in their environments allows us not only to ask them what they think of the products in front of them, but to physically see how they form their opinions. What stages of decision-making did they go through? Where were they looking? What did they compare the product to in order to reach their decision? These insights will inevitably inform better decisions and foster more intuitive results. If empathic research teaches us anything, it’s to be humble and realize that everyone on the planet is a designer — and is usually better at solving problems than we are. We all commit deliberate acts of organization to overcome problems, from the way we arrange our desks to the way we use a window to catch our reflection. Empathic investigation helps us to observe the ways in which people are already overcoming obstacles, and it often uncovers solutions that are more elegant than we’d expect. Trying to design a daily news-feed mobile app? Walk into any library and spend some time looking at how people physically interact with information. From bending page corners into bookmarks, to underlining in pencil to make scanning faster, to positioning journals side by side for easier cross-referencing, once you start to really look, you’ll gain insights that enable you to combine people’s half-solutions into even more useful experiences. In-situ prototyping of a tool to help hostel staff communicate with guests, on day 29 of 50. When we try to consolidate what we’ve learnt into design decisions, we do so in our studios, often on our high quality screens. Try picking up your pen, getting out of the office and finding a location in which someone might typically use the service you’re creating. Now try to design. You’ll soon have to deal with the same distractions, complications and restrictions that some of your users face. How does that affect your design decisions? There are many more techniques for getting under people’s skin, but these are just a few to start. Ultimately, empathic research is not about asking users what they want, but about understanding their needs for ourselves. So, what was the result of getting on that underground train, being squashed among busy commuters and feeling people’s anxiety for myself? Initially, the result was another pretty predictable solution. 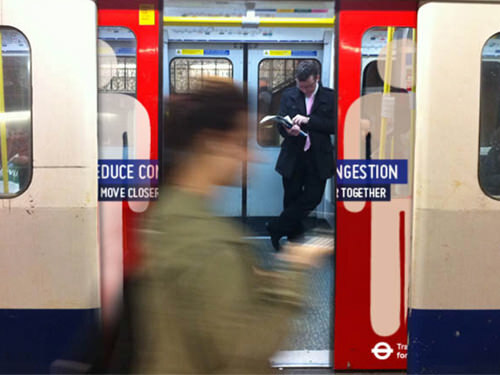 Leveraging the closing doors of the underground trains. 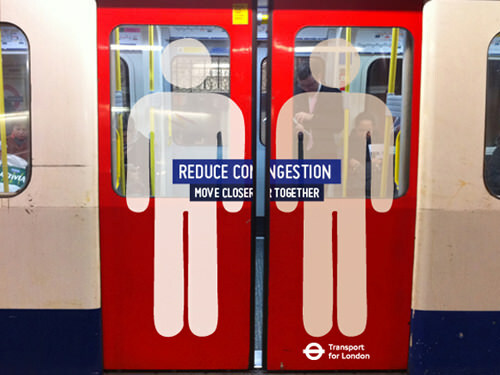 I leveraged the closing of the train doors to suggest that people move closer together. This didn’t feel good enough — more like a public-service announcement than an effective solution. The solution? To introduce “play”. 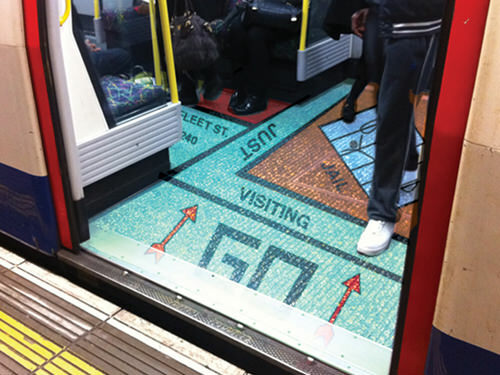 I transformed the floors of the underground carriage into a game of Monopoly. 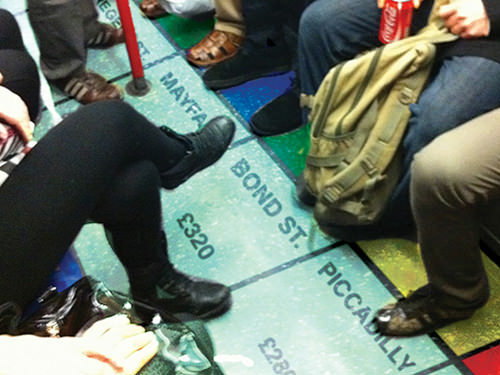 Rather than standing in jail, people are encouraged to move down the carriage, towards Mayfair — an engaging and participatory solution to a complex problem. Since being published, 50 Problems in 50 Days has received some super press and some unexpected awards. This particular solution was one of the most discussed and has been one of the most widely shared. 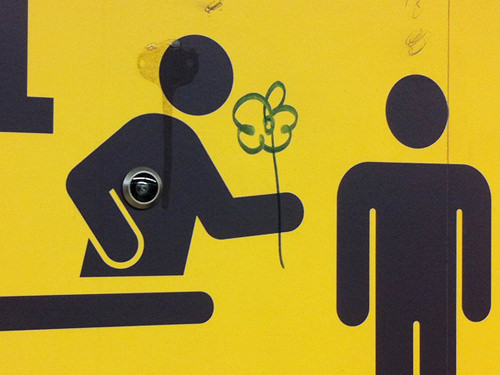 Empathetic understanding is a vital tool in fostering innovation. If we can better understand the people we are designing for, the better our decisions, designs and results will be. Travelling 2517 miles taught me that if we wish to innovate, we must go beyond analyzing people’s experiences and try and make them our own. Thanks for reading. Stay tuned for more problems, solutions and learning from my 2517-mile adventure. In part two, I’ll describe how trying to solve 50 problems in 50 days taught me it’s OK to be an utter fool… and how it’s OK for you to be one, too.